On December 28, 2015, Adobe issued a security announcement that they have repaired 19 vulnerabilities in one breath. The vulnerability CVE-2015-8651 submitted by Huawei security research department was mentioned in the acknowledgement section, but deleted very quickly and aroused speculations. Later, the domestic threat intelligence vendor Threatbook published an analysis report of foreign “DarkHotel” group targeting top executives in China with APT attacks. According to the sample hashes provided by Threatbook, Antiy PTA team has extracted relevant samples from the sample library and analyzed the principle of the integer overflow vulnerability. According to the official test report, the memory access speed of domain memory is very fast. ApplicationDomain.currentDomain.domainMemory here is a global variable which is directly accessed by the function li*/si*. After introduced, there are a lot of problems, typically such as vulnerabilities numbered CVE-2013-5330 and CVE-2014-0497, which are caused by imprecise boundary checks of opcode related to domain memory. Here it can be considered that loc_2 is equal to 0x80001004; so far, it can be construed as writing the value 0x3FFFFFFF into the location at 0x80001004+0x7FFFFFFC of domain memory. You can see from the code of cidkedie that domain memory points to a ByteArray array called fastmemory with the length of 0x1000. In the array, the first few bytes are filled with m3mory, and followed by a count that refers to the number of the function calls. With the heap-spraying technology, the function is called repeatedly to guarantee the specific memory accesses. After the command finished, ESi=0x80001004. After two commands finished, ebx is the memory address with the size of 0x1000 directed by ApplicationDomain.currentDomain.domainMemory. 1280 uint objects have been created, and their length is changed to 1022. The first DWORD value of each uint object memory is 1022, and if the memory of uint object is just following that of domainMemory, you can modify the value, then access arbitrary memories, and next create objects in the accessed memory to find the virtual function table of the object, modify the function pointer and execute shellcode. After comparison, it finds the length of uint object is replaced as 0x3FFFFFFF, and at this moment, the memory size of uint object becomes very large, so you can access arbitrary memories. 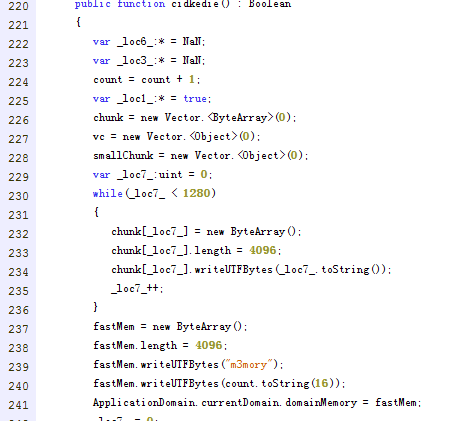 CVE-2015-8651 is an integer overflow vulnerability, which is caused by the imprecise judgment to the range of access addresses during the relevant executions of opcode to domain memory, and its principle is similar with CVE-2013-5330 and CVE-2014-0497. 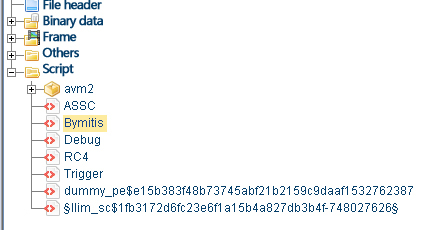 Finally thanks a lot for the sample hashes from Threatbook, Antiy PTA team can complete the analysis report. Starting from antivirus engine research and development team, Antiy now has developed into an advanced security product supplier with four research and development centers, nationwide detection and monitoring ability as well as products and services covering multiple countries. With a fifteen-year continual accumulation, Antiy has formed massive security knowledge and promoted advanced products and solutions against APT with integrated application of network detection, host defense, unknown threat identification, data analysis and security visual experiences. With the recognition of technical capacity by industry regulators, customers and partners, Antiy has consecutively awarded qualification of national security emergency support unit four times and one of the six of CNNVD first-level support units. Antiy detection engine for mobile is the first Chinese product that obtained the first AV – TEST (2013) annual awards and more than ten of the world’s famous security vendors choose Antiy as their detection partner.